Coming to the library at noontime for a coffee! In the end of June and in July you are invited to attend our “tub.talks”. After a brief impulse as thematic input, there will be room for joint discussions and a coffee, this is the new format, that we would like to continue with this second series after its launch in March – at that time under the label „Coffee talks“. The topics include aspects of using information, like publishing, researching or visualising as well as issues of the (new) German intellectual property law. Use the opportunities for exchange, to ask questions, to learn from one another and to discuss. Add your own questions and suggestions (also for further topics for additional talks)! We are happy to meet you! 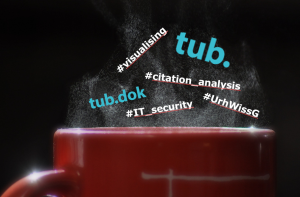 This entry was posted in Digital World, Learning, News, Open Access, Search and find, Subject Information and tagged citation analysis, Coffee Talk, intellectual property rights, Open Access, tub.talks, TUHH library by Detlev Bieler. Bookmark the permalink.